Published by Bertelsmann Euromedia Group in November 2002, this hard cover book is laminated in gold leaf with 274 pages of stunning color plates. There is a limited printing of 999 in English and 399 in Russian. Courtesy shipping within the continental United States. Inspired by the brilliant jeweled tones of Byzantine art and by the works of Faberge, internationally acclaimed Russian artist Yuri Gorbachev creates colorful, richly textured canvases in oil and gold that are widely collected and exhibited in galleries and museums worldwide. 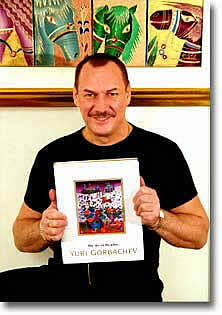 Gorbachev established a distinguished career as a painter in the Soviet Union before moving to New York in 1991. His whimsical paintings have illustrated Stolichnaya vodka advertisements in hundreds of magazines worldwide, and in 1996 the United nations commissioned an original work from Gorbachev for its "Endangered Species" stamp. 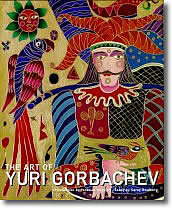 "THE ART OF YURI GORBACHEV"
This first monograph on Gorbachev presents 100 full color plates spanning the artist's career, while essays offer a lively profile of Gorbachev the man and artist. This beautiful book is divided into thematic sections spanning the artist's career. 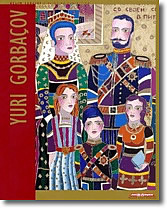 A colorful soft cover book with 57 color images. Book is hand signed by the artist - $35 + shipping.